I have been a fully qualified car nut since I first got my driver's license way back in 1959. 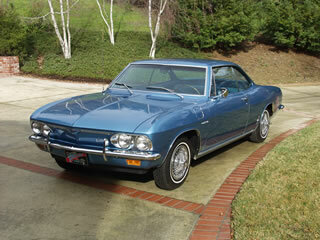 I owned four Chevrolet Corvairs during the sixties. I met my wife by teaching her how to drive a 4-speed Corvair Monza in 1962. I autocrossed a stock 1965 Turbo Corsa with some success in 1966-67. Together, we have been fortunate to own some great cars over these forty-some years. We also have owned some clunkers. Today, we still carry the Corvair gene because we are quite fond of rear-engined Porsches and own a 911S and a 911 GT3. 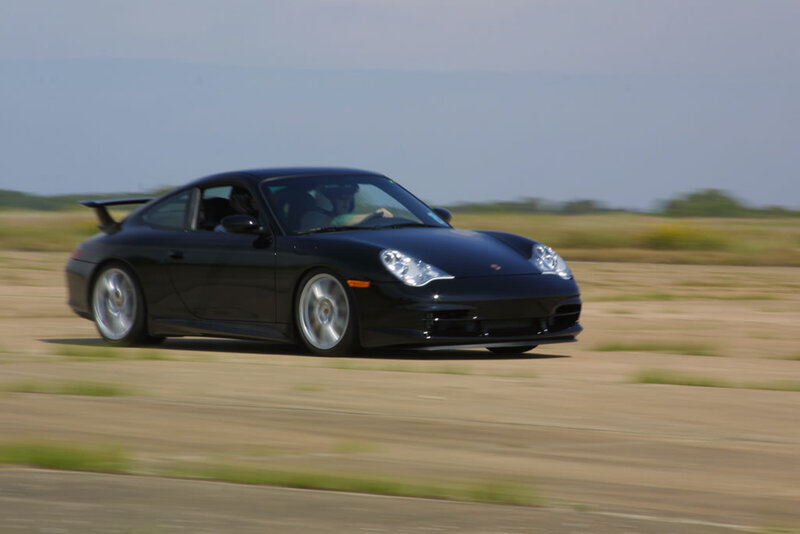 I started autocrossing the GT3 after a thirty-seven year hiatus, with less success. I also reached back in time and acquired three Corvairs that I believe represent the best of the line. This site contains information on cars in general and the Corvair in particular. The Corvair content starts with my personal history with this unique automobile. There are descriptions and photos of my current Corvair collection: a 1964 Spyder convertible, a 1966 Turbo Corsa coupe, and a 1966 Yenko Stinger (YS-071). The Spyder convertible is unique because it was specially outfitted for the 1964 New York and Chicago Auto Shows. An analysis of Ralph Nader's infamous "Unsafe at any Speed" book is included as well as a look at the market realities that led to the demise of the Corvair. Each topic in the "Cars and Corvairs" section can be accessed directly from the following topics table. Corvair Experiences: My experiences with a 1961 Monza, a 1962 Spyder, a 1965 Turbo Corsa, and a used 1961 Monza during the sixties. 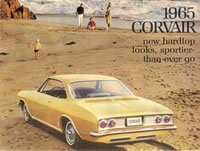 Some old Corvair photos, brochure scans, and family photos are included. My Top 5 Favorite Cars: Many are called but few are chosen. Here are the five cars that gave me the most pure fun & pleasure in over fifty years of motoring. The Nader Affair: A brief history of how an unknown lawyer made a name for himself by providing bumsteer on oversteer and understeer. Car Wars: Who killed the Corvair? The numbers tell the story (or do they?). This topic provides side-by-side production numbers for the Corvair and its competitors. 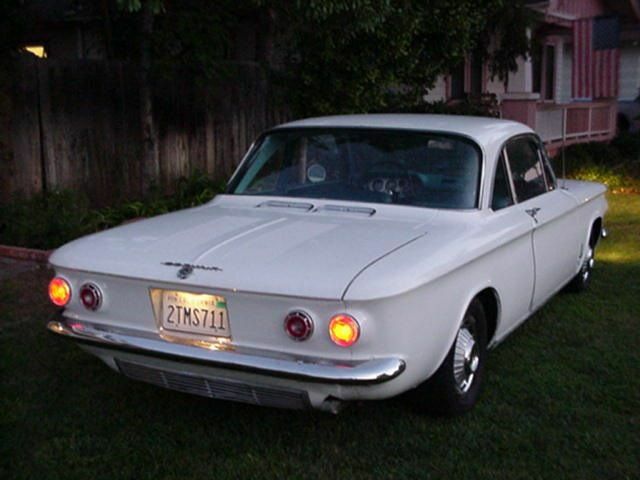 Then and now - I bought my first Corvair when a McDonald's hamburger cost 15 cents. 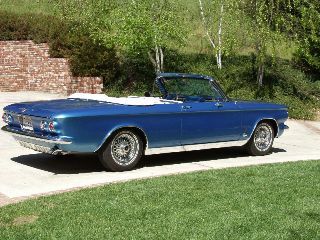 I look at what type of car I could get in 2006 for the equivalent amount of 1966 money. The result surprised me. 1962 Spyder Project Car: This was my first Corvair acquisition in the 21st century. I learned that there is great support for collecting and maintaining classic Corvairs. 1964 Corvair Spyder: Chevrolet built this car for the 1964 New York & Chicago Auto Shows. It sports special metallic paint, a custom full-leather interior, extra chrome, and Kelsey Hayes wire wheels. 1966 Corvair Corsa This was as good as it got. 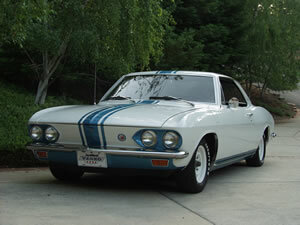 This Marina Blue Turbo represents the high water mark in Corvair engineering. It was featured on the cover of the January 2003 edition of the CORSA Communique. 1966 Yenko Stinger This is a Stage II Yenko Stinger that is one of the first 100 Stingers built for the initial Sports Car Club of America (SCCA) certification. Its Yenko serial number is YS-071. Car Clips on YouTube. I digitized some 1962-1963 8mm home movies recently and extracted some clips of racing and experimental cars that are posted on YouTube. There are two SCCA A Production races from 1962 and 1963 featuring Corvette vs Ferrari vs Cobra races. There is also two clips from 1962 & 1963 that I took at Elkhart Lake that capture the Corvar Super Spyder and Monza GT.